Going to Disneyland? There’s an app for that. 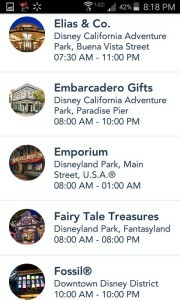 Okay, there have been several apps around for a while, but now Disneyland actually has its own “official” app. 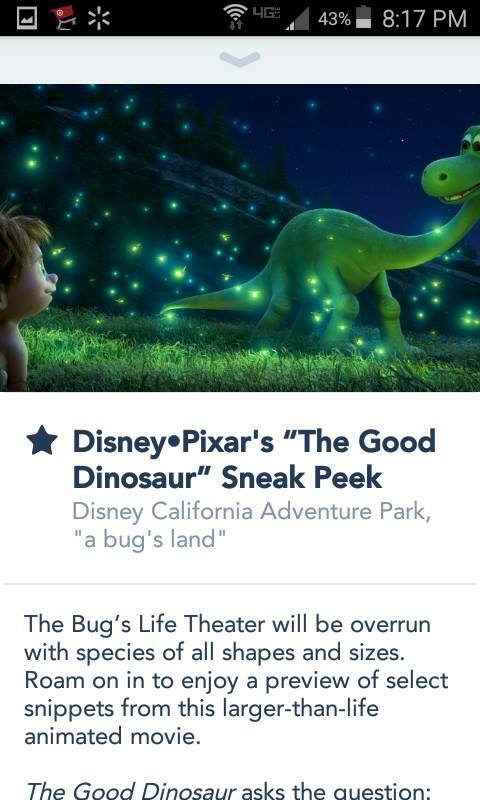 Yes, Disney is quite proud of it… and is doing its best to promote it to the throngs of people who flood those magical gates. 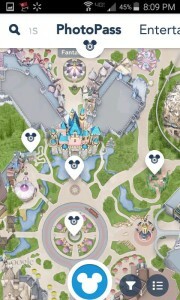 So here’s my review of the new Disneyland app, and also some tips to help you get the best use out of it. To begin with, Disney is constantly trying to review and improve it. So if you used it when it first came out and weren’t completely impressed, you may want to try it again. 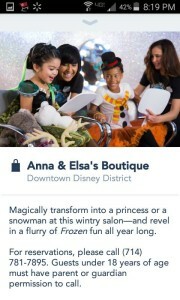 For example, when the Mickey’s Not So Scary Halloween Parties started this year, there was no special app feature. 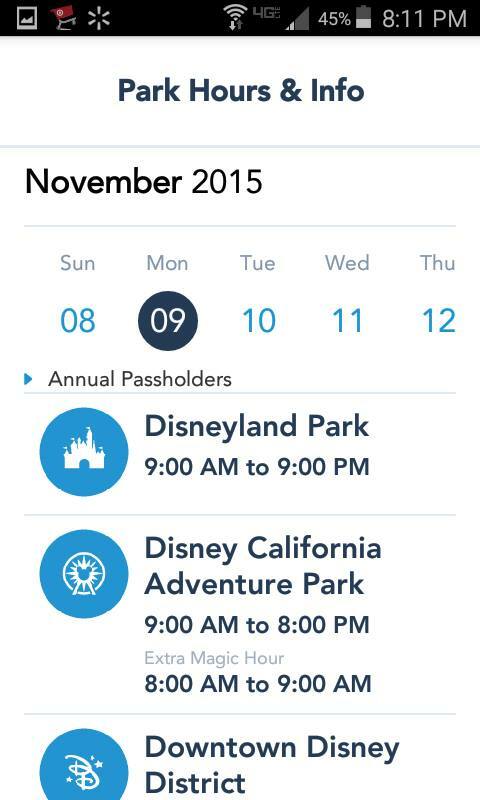 If the park closed at five, that’s when all the Disneyland app magic ended. However, after the first couple of parties, that feature was fixed, and all of a sudden you could find out the whereabouts of such villains as Anastasia and Drizella, or heroes such as Peter Pan and Wendy. That being said, as much as the app has improved, it is still a battery drainer. Which can be an issue, especially if you’re also using your phone for pictures, videos, or even just Facebook updates. Your best bet for being able to use phone and not have to worry about your battery dying is to bring a charger. We recommend using the Anker Astro Mini external battery. 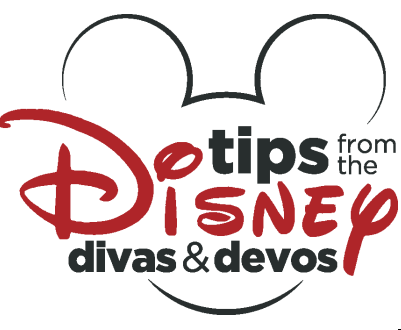 You can read a review with more details about it by D’Land Hubby here. 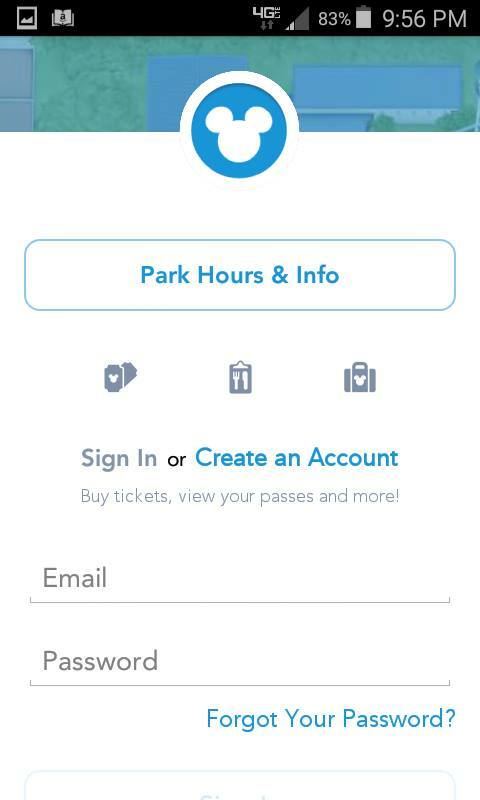 On the main page of the app, there is a place where you can sign in to access your trip’s details (if you’ve planned reservations in advance.) You can also find a link to Park Hours & Info which provides calendar information about 5-6 weeks out. 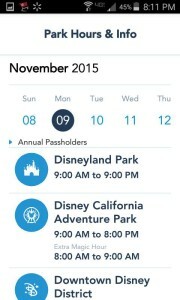 A little frustrating for those of you who want to plan months in advance, but Disneyland doesn’t post its schedule as early as Disney World does, and checking the Park Hours ahead of time is a great way to make sure you know what times each of the parks will be open (you most likely don’t want to arrive at Disneyland at 2pm if it closes at 5, unless you have a hopper pass and California Adventure is open until 10pm.) 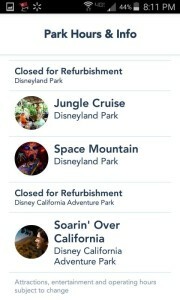 This will also tell you what rides and attractions will be closed during your stay, which as disheartening as that can be, it’s a lot easier to soften the blow that Space Mountain will be closed during your visit, than running over to try and get a Fastpass and realize that you should have been trying to get Fastpasses for Splash Mountain instead. The app itself, is broken into several categories: Attractions, Characters, Dining, Restrooms, PhotoPass, Entertainment, Events & Tours, Guest Services, Hotels, Recreation, Shops, and Spa. Let’s look at each one shall we? 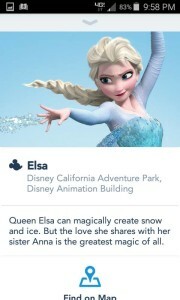 All of the categories have icons that show you where each of the experiences is located, or you can also view them in a list format (which as my sister can attest, is particularly helpful for those of you who aren’t familiar enough to know the difference between where Snow White’s Scary Adventure or Peter Pan’s Flight is). 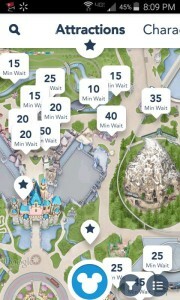 Personally, I prefer the list format when looking up attraction wait times, as well as characters. In an effort to 1.) Conserve my battery 2.) See what my options are, and 3.) Come up with a strategy as quickly as possible without spending a whole lot of time standing around. A quick check on the app and I am back on my way to experience more of the rides and characters, as opposed to trying to predict whether it would be better to ride the Matterhorn or Big Thunder Mountain Railroad, or whether Cruella de Vil will still be out and about after lunch. 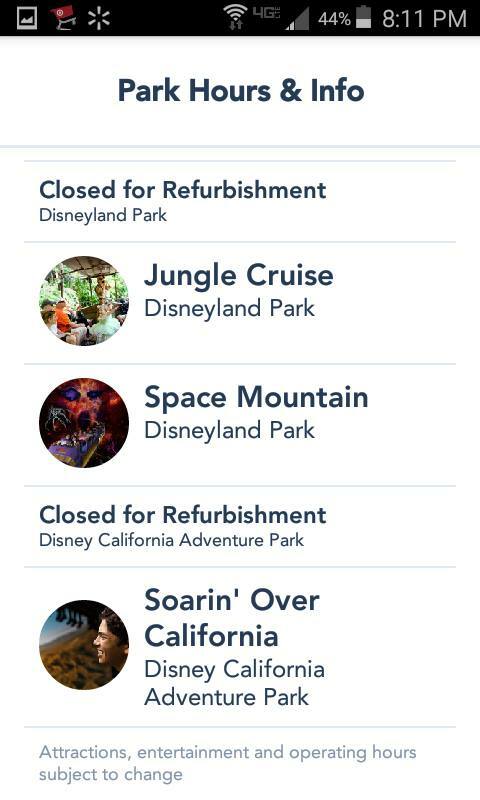 Attractions- As mentioned before, the app lists which rides are closed for refurbishment, but it also lists which rides are temporarily closed (mechanical issues, weather issues, etc.) It also provides wait times for each of the rides. 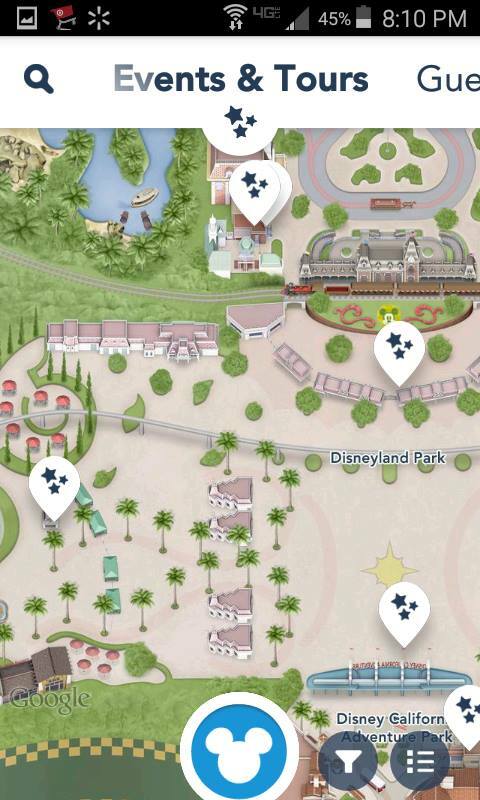 So if you want to know if it’s worth making the trek over to ride Finding Nemo Submarine Voyage when you just got off Winnie the Pooh, or if you should stop at Haunted Mansion on the way, this can be a great way to strategize what rides to ride (or avoid). And if you wanted to ride the Monorail, but see that it’s temporarily closed, you can save yourself the walk and try back later, or just find something else to do instead. 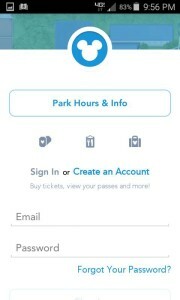 It also lists the current Fastpass Return times, height requirements and explains the process of how to obtain a Fastpass. 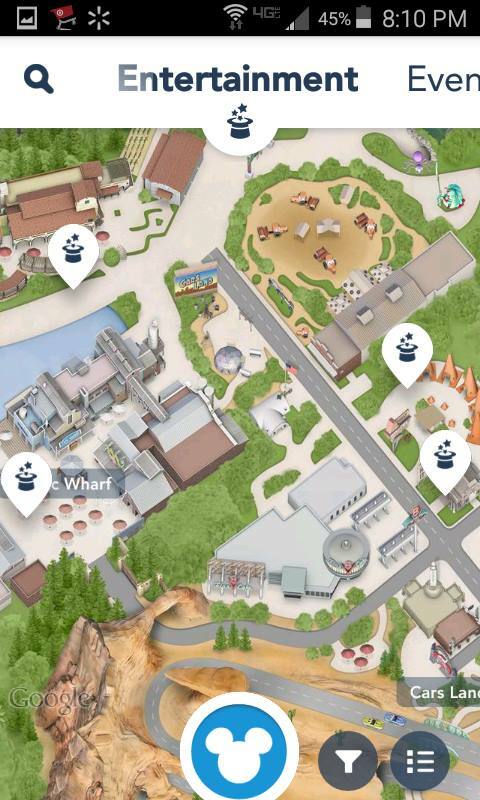 Disney Diva Tip: If you’re trying to find the Fastpass Distribution Center, it’s actually listed under the Guest Services Tab. 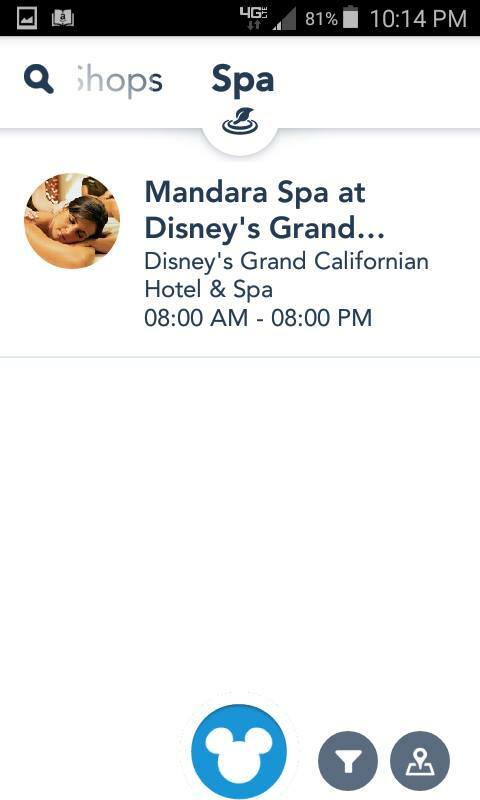 Not where I would expect to find it (particularly since other features like the Grand Californian’s Spa is listed in multiple places), but if you’re looking for one, that’s where it is. Characters- This is a great feature to figure out where characters will be and when. If meeting characters are on your list, or if you or someone in your party has a huge desire to see a particular character, knowing that Rapunzel will only be out for another 20 minutes or knowing that Dug will be back out at 11:15-11:45 a.m., 12:15-12:45 p.m., and 1:15-1:35 p.m. is invaluable at planning your day. Also, if a character will be in multiple locations (i.e. 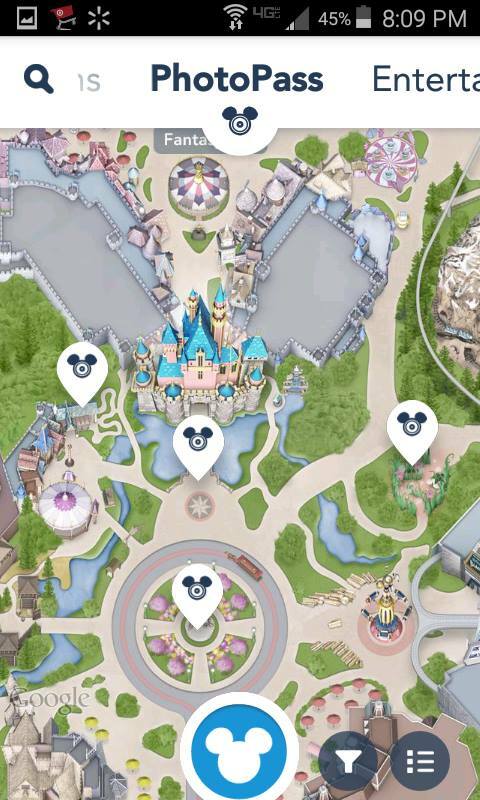 Mickey and Minnie, there will be a little triangle next to their name, which when clicked on, will tell you all of their locations for that day. However, there are again, limitations. 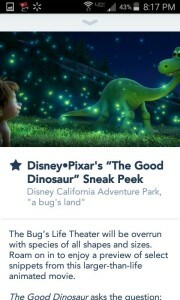 For example, the app does not list which characters will be at a particular character meal and when, and the Disney Visa Cardmember Meet & Greets do not show up (currently Minnie Mouse and Stitch at California Adventure and Darth Vader at Disneyland), nor does it mention whichever fairy is greeting guests with Tinkerbell in Pixie Hollow. 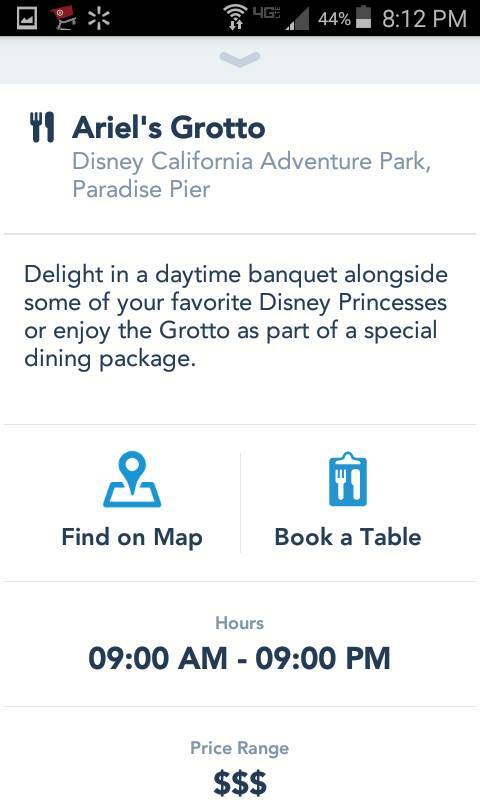 Dining- The nice thing about this app is that you are able to check for reservations, and make them as well. 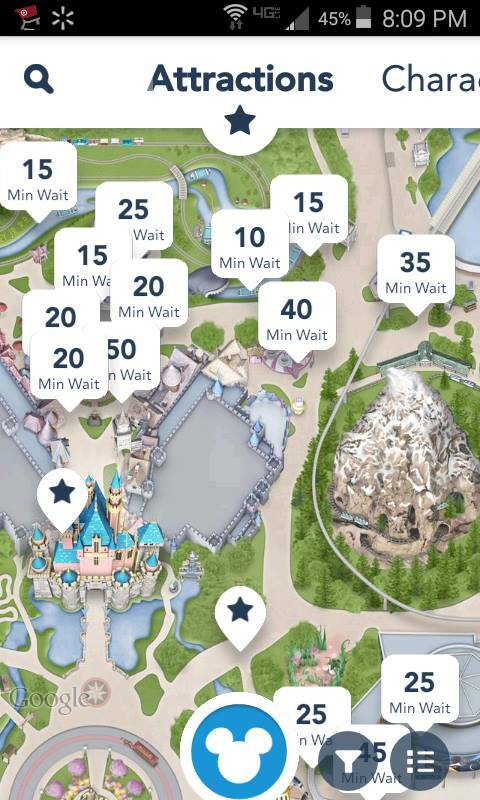 Unfortunately, there isn’t a feature that tells you how long the wait is for a place, but as you know, Disney does a very good job of getting many people through a line as quickly as possible. 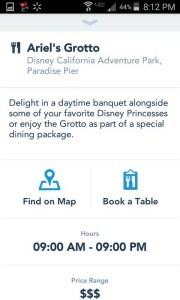 And if you weren’t planning on dining at Ariel’s Grotto but suddenly changed your mind, or if you want to celebrate a special occasion for the Blue Bayou and forgot to book your reservation, you can check and see if there are any left to claim during your time there. 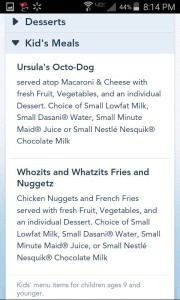 Another nice feature about the app, is that in addition to seeing what time the restaurant will be open and what meals they will be serving, you can see where it falls on the price scale ($-$$$), whether or not it qualifies for a Disney Visa Cardmember or Annual Passholder discount, and you are able to check the menu (something that I couldn’t find when the app first came out). 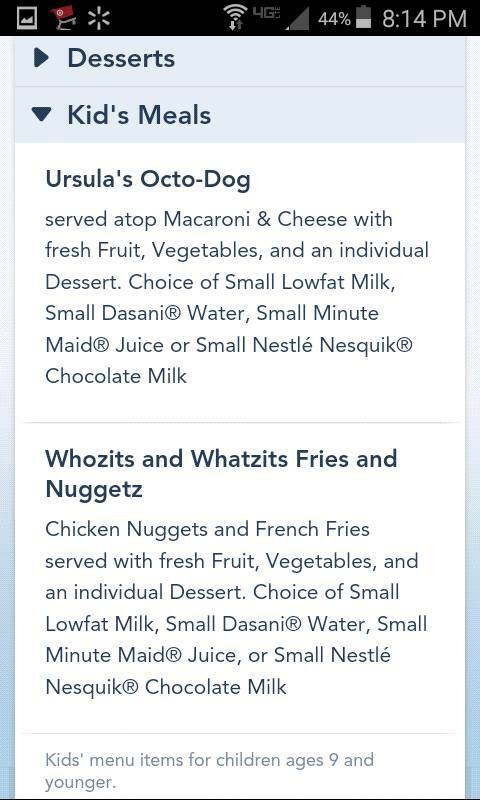 So if you want to see what comes with “Ursula’s Octo-Dog” or “Whozits and Whatzits Fries and Nuggetz”, and if it’s worth spending the money or if it would be better to order a chicken quesadilla for your child from Cocina Cucamonga instead, this can be a great tool to help you decide what works best for your schedule, budget, and of course, tastebuds. 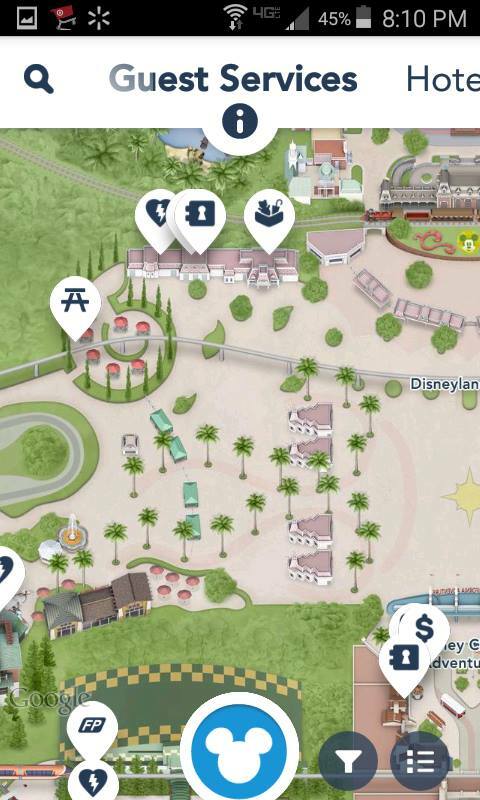 Restrooms- This category is pretty self-explanatory, but if you aren’t as familiar with the layout of the park, or someone in your party suddenly needs to go, this is a great way to find a bathroom in a hurry. 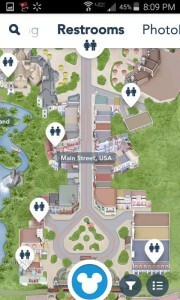 Entertainment- This is the place where you will find lists and times for all of Disney’s parades, dance parties, shows, and other forms of entertainment. If you want to know what time Disney’s Aladdin- A Musical Spectacular is playing or where to find it, what times Fantasmic! can be seen, when the Jedi Training Academy will be, what time the Flag Retreat Ceremony is, or information on when the Disneyland Band will be performing, this is the place to check. 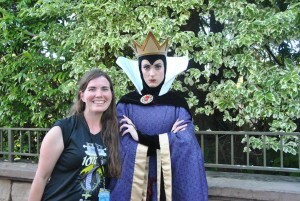 Events & Tours- While some events and tours happen all year-long, there are also some that are seasonal, such as “Three Kings’ Day” and “Disney’s Happiest Haunts Tour”. 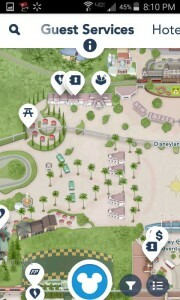 In this section of the app, you can find where the tour takes place and what time it begins, an icon to call and book the tour, what the price per adult is, whether or not you can get an annual passholder discount, what age group the tour would most appeal to, and what type of experience they would classify it as (Holiday Events, Park Tours, etc.) If you want to do something other than meet characters or ride rides and you don’t mind shelling out some extra cash, you may want to check out one (or more) of these tours, particularly “Walk in Walt’s Disneyland Footsteps” Guided Tour. Guest Services- If you’re one of those people who find yourself asking “Where can I find ___?”, this section is probably for you. Whether it’s an ATM, a Baby Care Center, an Automated External Defibrillator (AED), where the designated smoking areas are, or where the Fastpass Distribution Center is (to name a few), this is where you will find your answers. 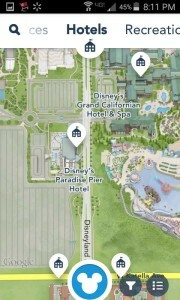 Hotels- While you will of course find information on Disney’s own resorts, you will also find information on all of Disney’s Good Neighbor Hotels (Hotels not owned by Disney, but which offer many of the same perks of staying at Disney). 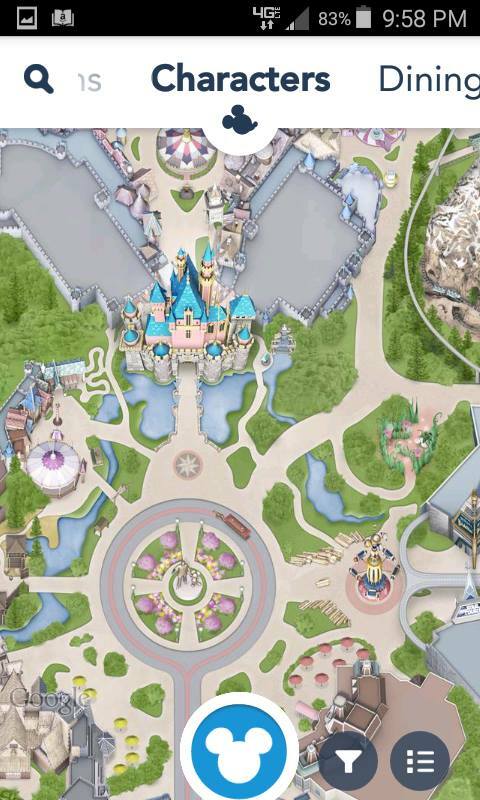 You will be able to see how close it is to the parks, what its address is, and there is also an icon where you can call to book your stay. 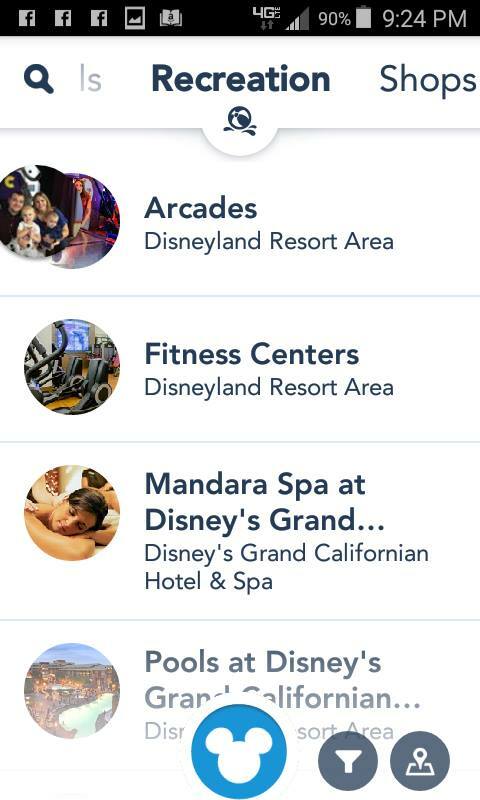 Recreation- This is where you will find information on the arcades, fitness centers, spas, and pools (for hotel guests only). 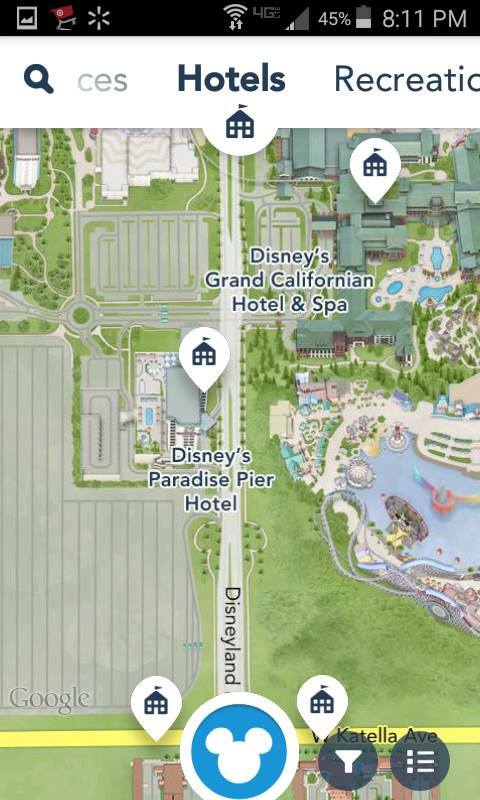 You won’t find much in this section, but if you’re staying at a Disney resort hotel, you may find this information useful. 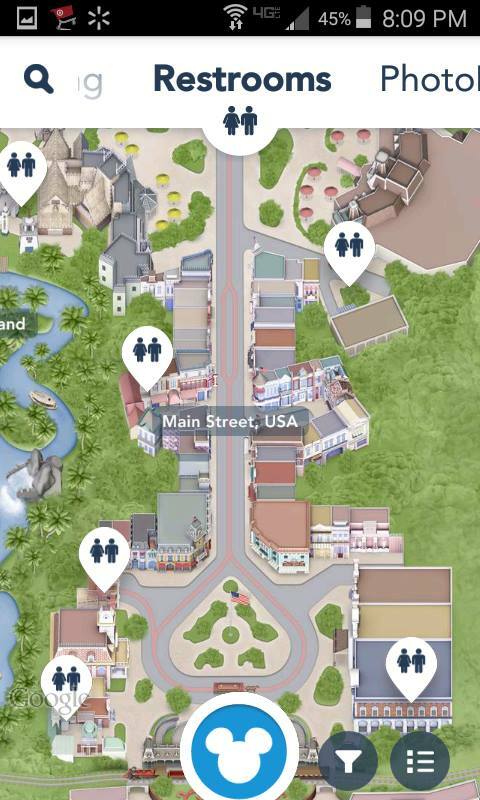 If you click on the shops icon and have your map focused on Main Street, almost the whole screen will be lit up with little shopping bags. And while Main Street or Downtown Disney are obvious places to find shops, there are many more that are scattered throughout the parks (particularly by all of the main headliner attractions). But if you are trying to find out where you can buy Mickey Ears, Disney Pins, Art & Collectibles, or if you want to make a reservation to Anna & Elsa’s Boutique or Bibbibi Bobbidi Boutique, this is a good place to check out. 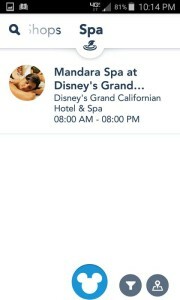 Spa- There is only one spa listed on the app (Mandara Spa at Disney’s Grand California Hotel & Spa). Honestly, it almost seems like a waste of space. But if you’re trying to find it on the map or you want to call to book an appointment, you may enjoy this section. So there you have it. 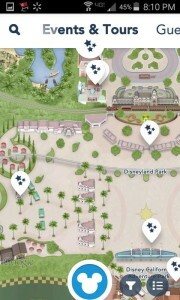 My thoughts on the Disneyland app. 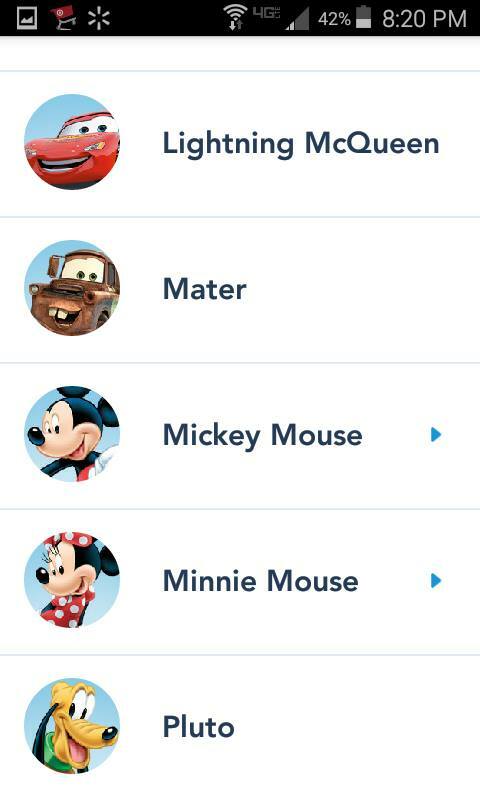 As mentioned before, I primarily use it to check ride times and what characters are out and about (my kids even like to have me check which characters are out even when we aren’t there). Those two things in themselves make it worth downloading the app onto my phone. 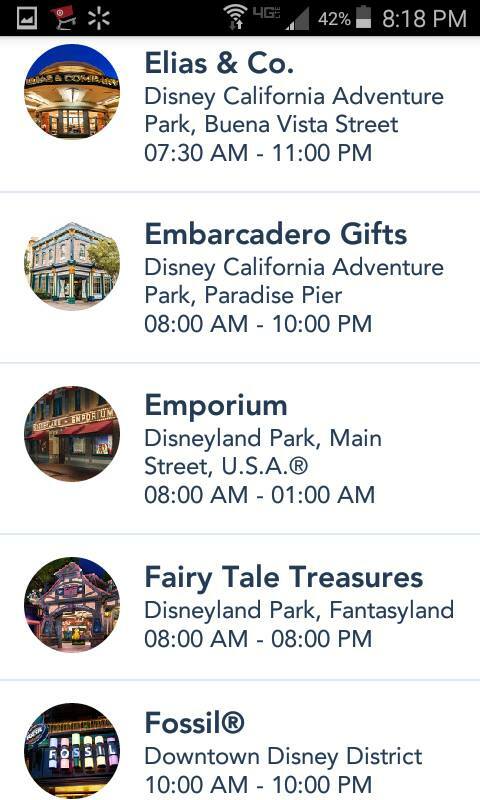 So whether it’s your first trip to Disneyland, or you’re a seasoned veteran, make sure you get the app (and keep your phone charged)! 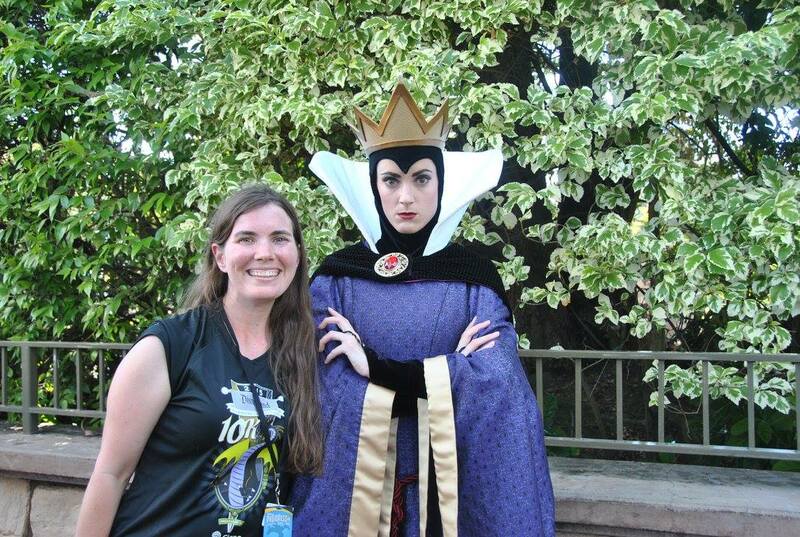 And if you want extra help planning your next trip to Disney, make sure you contact Patricia Payne from All For Dreams Travel here for a free quote. 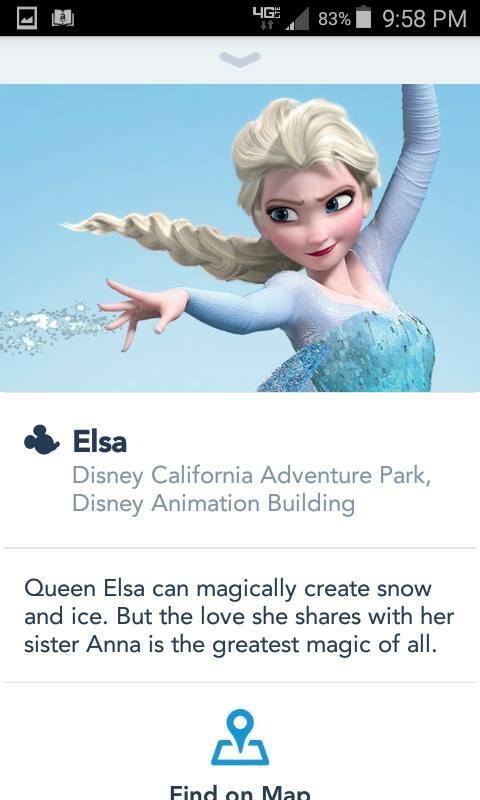 Disney Diva Disclaimer: All of the images of the app are screenshots taken from my phone of the Disneyland app. 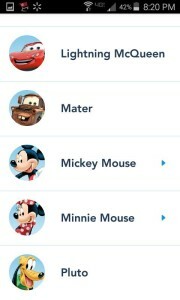 All of the original graphics belong to Disney, and are only being used in the article to provide you with a visual so you can have a better idea of what the app is like.